Gallery walls are having a major moment right now. Gallery walls are basically an arranged artistic display of things that matter to you most including mirrors, pictures, arts & crafts, frames, Initials etc. There are really no rules when it comes to a well hung gallery wall, it’s really all about what you think works for your space. I recently finished my gallery wall and have some tips that I want to share with you that made it easier for me. Gallery walls are a process (mine took 6 weeks to complete) but don’t fret, YOU GOT THIS! One picture at a time. *Mirror, clock, and framed elephant art available at Target. *Twine wrapped Letter ‘F’, gold paint, decorative keys, tweed heart, and oval wood piece with keyhole ceramic piece all available at Michaels. *Weathered brown frame (upper right) available at West Elm. *All other frames available at Home Goods. * Check Pinterest and Instagram Check these sites for gallery walls to see what styles, colors and arrangements you like. *Everyone Can afford a gallery wall: My gallery wall pictured above includes only 2 pricey pieces, the rest are super affordable pieces (hello $25 mirror) mixed with DIY stuff. Don’t let your budget stop you! Also, Don’t limit yourself to only store-bought items. If you love a particular frame in your home, you can paint it to match your theme. There are youtube tutorials for EVERYTHING and you can watch step by step videos on sanding, staining and painting frames. *Make it your own: pick a color palette. I chose ivory, black & gold. All of your art doesn’t need to match, but having 2-3 primary colors makes it more cohesive when completed. I also went with only black & white prints and photos to keep things uniform. *Don’t be afraid to use different frames: Different sizes, shapes & colors only add to the greatness of your gallery wall. 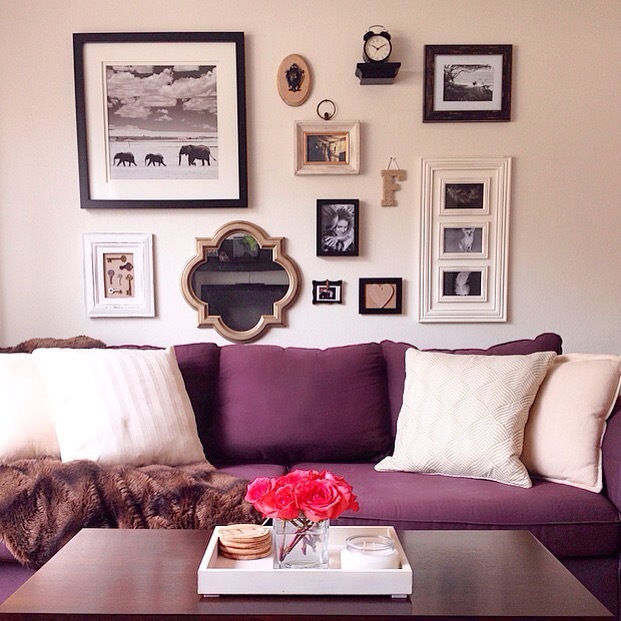 *Lay it out: I cannot stress enough to lay out your gallery wall arrangement BEFORE putting anything on the wall. I layed mine out on the floor, changed it around a few times, took pictures and compared the pictures until I was happy with the arrangement. *All in the family: Tie your gallery wall colors in with your surrounding couch, blankets, coffee table, and throw pillows. This keeps everything cohesive within the space. *Hang time: Hang your artistic representation any way you want. I keep reading all sorts of rules about arranging your gallery wall, but just remember- it is YOUR gallery wall so hang it how you want. As long as it’s balanced with shapes & spacing, your gallery wall will be just fine. Speaking of spacing: The wall is your friend- the space between your art is just as important as the art itself. I started with putting my largest piece up and went from there. I chose to not put the largest piece dead center. I feel like that would be expected and it can cause your eye to be drawn toward that piece and not all of the fun stuff around it. Breathe: You can do it!